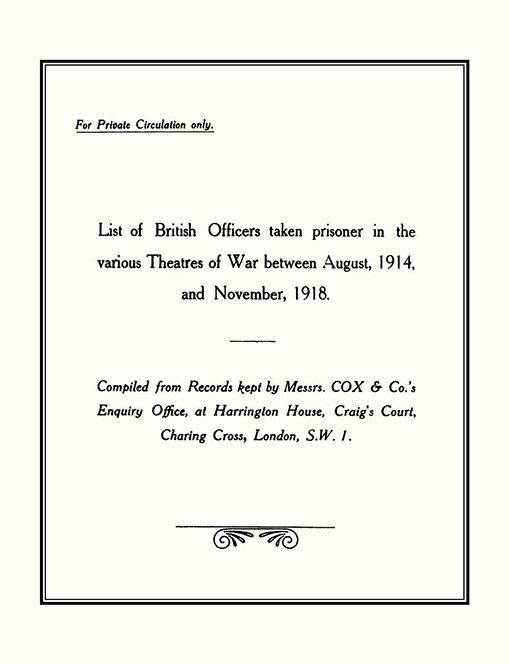 LIST of BRITISH OFFICERS TAKEN PRISONER in the VARIOUS THEATRES of WAR Aug 1914 to Nov 1918. Some 8,700 names are listed. Deaths in captivity are noted together with dates reported missing and dates of repatriation. The index lists every name in alphabetical order. First printed 1919 for private circulation this rare volume (in its first printing) was compiled from records kept by Messrs Cox & Co.’s Enquiry Office, which opened in Sep 1914 in Craig’s Court, Charing Cross and gained full support of the War Office. 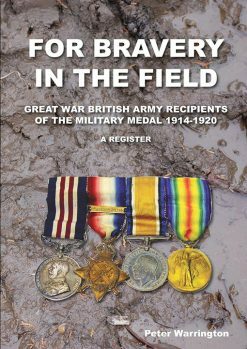 Some 8,700 names are listed, including officers of the RAF, RNAS, RN Div and Dominions. Names are shown by regiments/corps and by battalions within regiments in the order of capture. Deaths in captivity are noted together with dates reported missing and dates of repatriation. The index lists every name in alphabetical order. At the outset, the aim was to give advice and information to relatives regarding wounded officers with the British Expeditionary Force. A system was also built up of obtaining all available information regarding officers reported ‘Missing’, and this gradually came to be the principal work of the enquiry office. 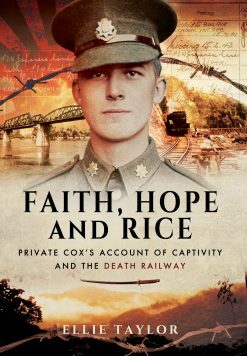 The information collected was obtained in various ways but chiefly by means of the fact that a missing officer’s cheque was often the first intimation that he was a POW, and it appears that a high proportion of cheques cashed by officers in captivity passed through the hands of Messrs Cox & Co. Details shown are name, rank, regiment/corps, battalion, date missing, date interned and date repatriated, some records have additional notes, for example death in captivity.A very valuable source of information.